All these are the joints between lower 6 cervical vertebrae. They contain joints between the vertebral bodies, vertebral arches and vertebral articular processes. They are of 2 types, viz. These are joints between 2 bodies of adjacent vertebrae from second to seventh cervical vertebrae. The adjacent articular surfaces are held together by an intervertebral disc and covered by the plates of hyaline cartilage. The disk is fibrocartilaginous type. It is composed of an inner part comprising jelly like material referred to as nucleus pulposus and series of fibrocartilaginous laminae named annulus fibrosus create the outer part. The most peripheral laminae of annulus fibrosus, on the front and on the back they combine with powerful anterior and the poor posterior longitudinal ligaments and are created of pure collagenous tissue. The disks are bound to the borders of the hyaline cartilages and bodies of the vertebrae securely. The intervertebral discs leading to the anterior convexity of the neck are thick anteriorly in the cervical region. Between the very first 2 cervical vertebrae there are no disks. 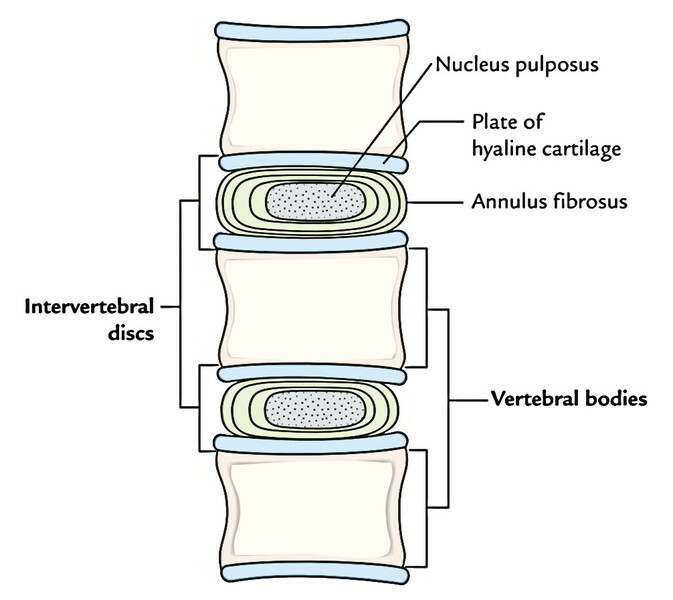 The intervertebral disc together create the intervertebral symphysis with hyaline cartilage covering the upper and lower articular surfaces of the adjoining vertebral bodies. 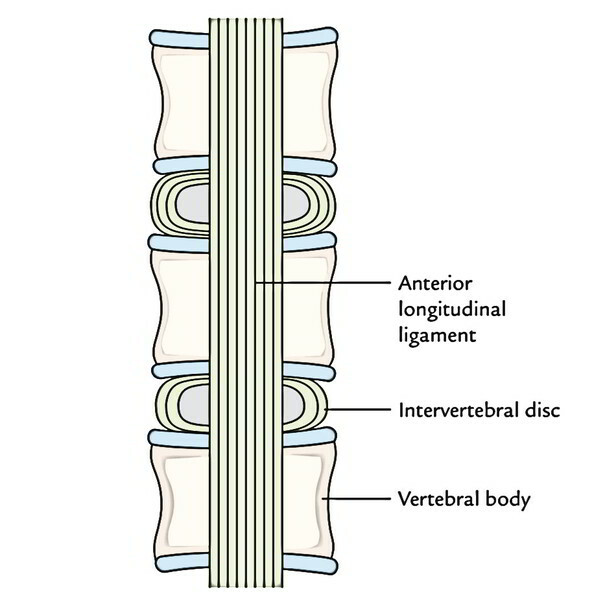 Anterior longitudinal ligament: It goes anterior to the anterior arch of atlas and bodies of staying cervical vertebrae. It’s a powerful ligament and is composed of long and short fibres. The long fibres are superficial and bridge across several vertebrae on the other hand short fibres are deep and bridge across an individual pair of vertebrae and mix together with the annulus fibrous of the intervertebral disc. Posterior longitudinal ligament: It runs longitudinally across the posterior surfaces of the cervical vertebrae and for this reason situated inside the vertebral canal. Above, it’s connected to the body of C2 (axis) vertebra and continues above as membrana tectoria. It’s pretty wide where it’s connected to the intervertebral discs but narrow over the bodies. It’s loosely connected to the bodies to supply space for basivertebral veins and paravertebral venous plexus. It’s poorer than anterior longitudinal ligament. 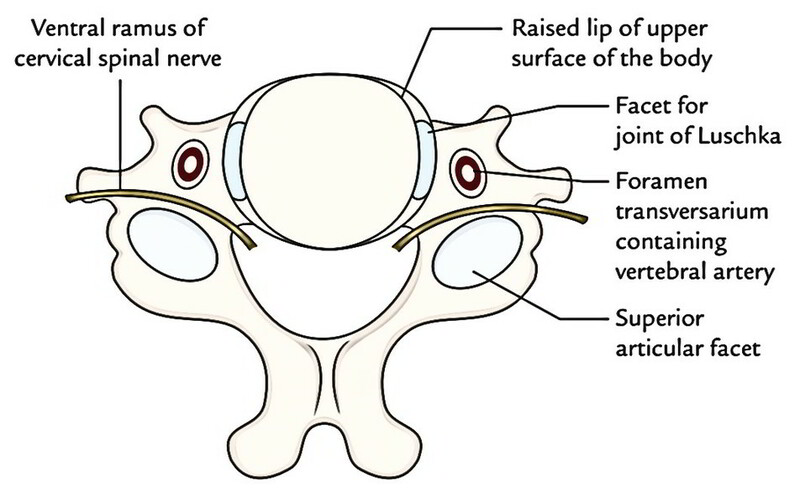 Its superficial long fibres bridge across three or four vertebrae on the other hand its short deep fibres go between adjacent vertebrae as perivertebral ligaments and are connected to annulus fibrous of the disk. Prolapse of intervertebral disc in the cervical region: Itusually entails the disk between C5 and C6 or C6 and C7. The nucleus pulposus usually herniates in the postero-lateral guidance and compresses a nerve root. The herniated disc between C5 and C6 compresses C6 nerve root, for this reason patient feels pain in the thumb, on the other hand herniated disc between C6 and C7 compresses C7 nerve root and therefore there’s pain, tingling and numbness on the posterior aspect of arm, forearm and middle and index fingers. 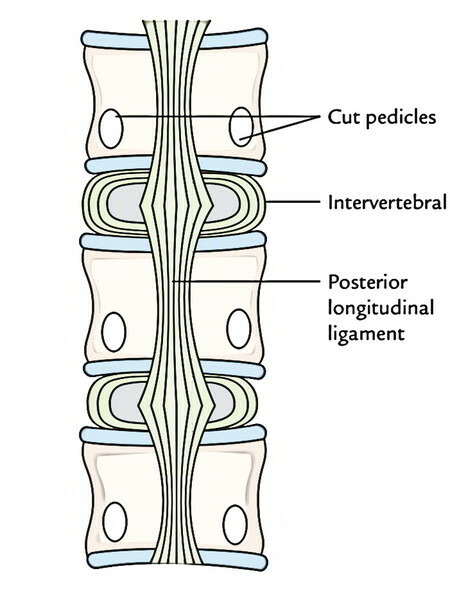 The lateral margins of vertebral bodies overlap the sides of intervertebral disc and directly joint to create small synovial joints of plane variety named joints of Luschka. Cervical spondylosis: It’s the most often occurring clinical illness changing the neck. Degenerative changes appear in the cervical spine, regularly during the third or fourth decade. The disc space between the 5th and 6th cervical vertebrae is most often changed. The first changes are confined to the intervertebral disc but the facet joints and uncovertebral joints (joints of Luschka) get involved shortly. The joints of Luschka are the commonest sites of formation of osteophytes. Since cervical nerve roots are located posterolateral to these joints, they’re frequently compressed by the osteophytes resulting in pain along their distribution. The foramina transversaria comprising vertebral artery is located lateral to these joints, for this reason osteophytes can also cause distortion of vertebral artery resulting in vertebrobasilar insufficiency which medically presents as dizziness and allied symptoms following jerky neck movements. 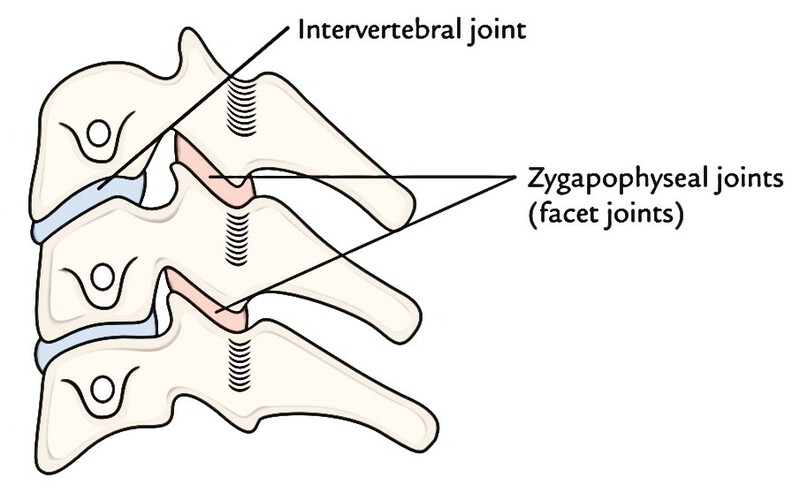 Joints between the articular processes of vertebrae (zygapophyseal joints). 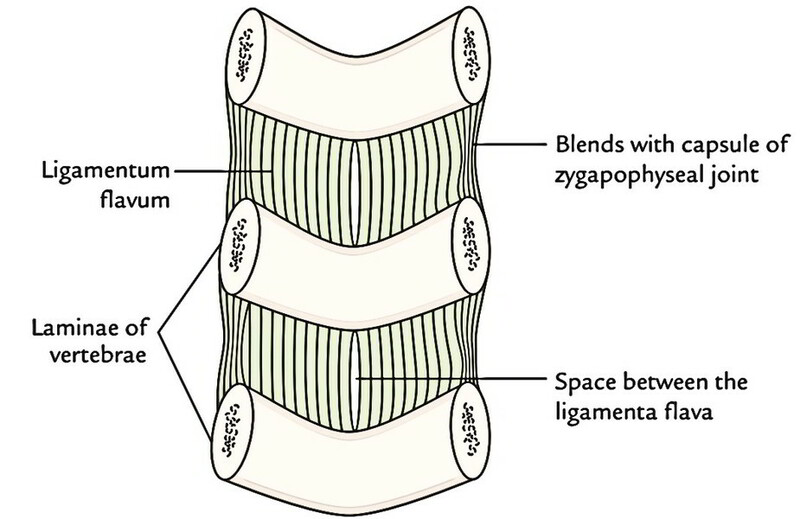 Intervertebral syndesmoses between laminae, spines and transverse processes. These are joints between the superior and inferior articular processes of adjacent vertebrae. All these are synovial joints of plane variety. The articular surfaces are covered by hyaline cartilage. The articular surfaces are inclined horizontally and slope inferiorly from anterior to posterior. This enables rotation of neck to look sideways and upwards. Fibrous capsule: It’s thin and free and connected to the periphery of articular facets. Allows side to side rotation of the neck. Dislocation of vertebrae without fracture: It happens only in cervical region due to the inclination of the articular surfaces of articular processes. In thoracic and lumbar regions, dislocations are consistently connected with fracture of articular processes. The dislocations mainly take place between 4th and 5th or between 5th and 6th cervical vertebrae. Between the adjacent laminae: Ligamenta flava attach the laminae of adjacent vertebrae. They go from lower border of lamina above to the upper border of the lamina below in the vertebral canal. They’re mostly created from yellow elastic tissue. The ligamenta flava stop the separation of laminae in spinal flexion and help renew the erect bearing after flexion thus shielding the disk from the injury. Between the adjacent spines: Interspinous ligament attaches the adjacent spines and supraspinous ligaments attach the tips of spinous processes. Between the adjacent transverse processes: Theintertransverse ligaments attach the adjacent transverse processes. They’re extremely feeble in cervical region and mostly replaced by intertransverse muscles. All intervertebral joints are innervated by adjoining spinal nerves, especially by their posterior sections. Flexion is forwards on the other hand extension is a backward movement. Both these movements have extensive range of motion. Lateral flexion is the bending of the neck to 1 or the other side with extensive range of motion. Rotation is a writhing movement with greater degree of freedom. Circumduction is the combo of all the aforementioned movements. All these movements are improved by movements happening at craniovertebral joints.